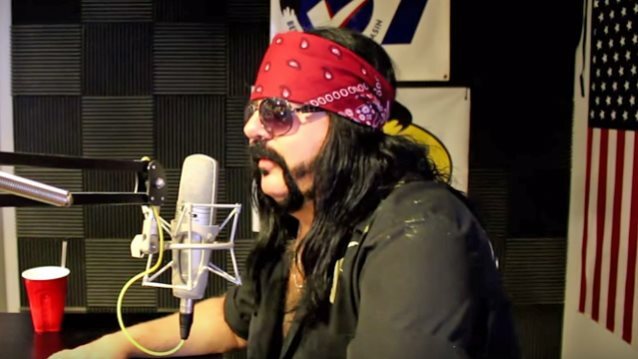 During a recent interview with the KBAT 99.9 radio station in Odessa, Texas, former PANTERA and current HELLYEAH drummer Vinnie Paul Abbott spoke about the possibility of one day retirining from playing music. He said (see video below): "I'm a big kid. I've never been married. I don't have any kids myself. I'm married to music, and I love playing music. I love being on the road, I love traveling, I love interacting with the fans and friends and fans and metal on the way. And until the day comes along that I can't do this anymore, I'm gonna keep doing it. I love it." While continuing to stay busy with HELLYEAH, Vinnie is involved with several side businesses, including running strip clubs, a sports bar, a music complex and being the owner of three of his own tour buses. "[I have] several [strip clubs]," Vinnie said. "I have The Clubhouse in Dallas and then I have a chain of Latino[-themed] strip bars, called Chicas Bonitas. We have one in Las Vegas, one in Austin, one in Dallas. And we're looking at other locations. We're thinking about getting into Arizona sooner or later. So I have that. Then I also have a sports bar in Dallas called The Back 9." In a 2014 interview, Vinnie Paul talked about why he chose to branch off and do other things besides play in a band. He said: "I've always been a down-to-earth business guy. That was the beautiful thing about me and my brother [late PANTERA guitarist 'Dimebag' Darrell Abbott] as we worked together, is that I could be the business guy, and he could be the party-all-night-rock-and-roll-all-day guy, and he would be the life of the party and I would be able to make sure we were all getting paid and things were getting done right." He added: "I like being able to own things, to not have to depend on music to support myself. Music hadn't supported me since 2000. I mean, it really hasn't. I just do it because I love doing it."